Explorer makes discovering apps that are relevant to you quick and easy using lots of different data points. A common use-case is to summarize the results to gain a quick understanding of the data and validate it. 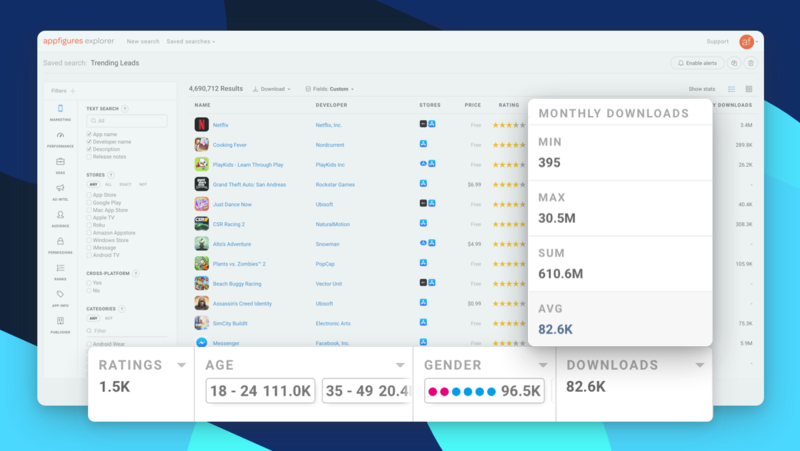 With the new Stats Bar, totals, averages, top values, and other essential metrics are calculated automatically as you search, saving you time and giving you immediate insights. When you run a search in Explorer, the Stats Bar automatically inspects all of the results and generates summaries for every field in the table. For numeric fields, like estimated downloads and ratings, the Stats Bar will display the sum, average, min, and max values. For fields that have classes, like audience gender or developer country, the Stats Bar will display the top values. Because the Stats Bar inspects all of the results, you won’t have to page through large lists or export the results for analysis anymore. It’ll all happen automatically and instantly! The Stats Bar is now available to all Explorer members across all plans. Not using Explorer yet? Schedule a demo and let us show you what it’s all about.